Pretty soon, 1,400 IT leaders, vendors, partners and providers to the legal industry will land in Las Vegas, all ready for ILTACON 2017. The Workshare crew will be in that number, so please navigate your way towards us for some fun, excitement and learning experiences. 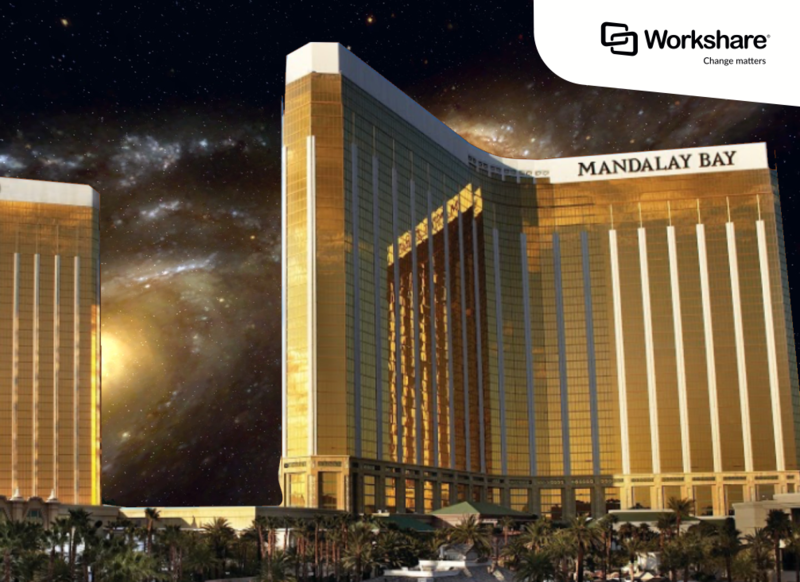 The four-day extravaganza that is ILTACON is the biggest event in our calendar and we don’t want you to miss a thing! Here’s a breakdown of what Workshare has planned and, hopefully, you’ll find time for us in your itinerary. Monday night is party night in the Exhibit Hall at ILTACON, where a galaxy of guests appears to meet old acquaintances, make new friends and survey the landscape for the week ahead. Workshare is on course to embrace the ‘Galaxy’ themed evening, with a Star Wars twist! We would be honored if you would join us at booth 205/207. Come and have your picture taken with one of our storm troopers and use our hashtag photo printer to create a souvenir of the event. You can also enjoy an ice cream that’s out of this world, made using liquid nitrogen. Don’t worry, it’s complete safe and the latest thing in delicious, ice-creamy, vanilla (with all the fixings) goodness. Ryan Soosayraj, Workshare’s head of product management, is making a guest appearance with Microsoft at their booth, #832/834, on Tuesday 15th from 9am to 11am. He can take you through how Workshare’s DeltaView comparison increases productivity for end users and how file exchanges are secure with Workshare embedded across the Microsoft ecosystem. And, of course, our Workshare Guru bar is open all day at booth #205/207! Come and visit us any time to talk about the future of file comparison, the future of file security and the future of transaction management. Our crew will be ready, willing and able to guide you through any of these topics. This is the one we’re all super-excited for! Our CTO and Tech Jedi, Barrie Hadfield, is leading a ‘Solution Spotlight’ in Oceanside C at 11am to showcase Workshare Compare Everywhere. The solution embeds Workshare’s leading comparison technology within the most widely used Document Management Systems (DMSs) in this universe. Embedding with iManage Work 10 and NetDocuments, there are some surprise editions to our growing number of partners, and they’ll be revealed during Barrie’s presentation. Barrie will also bring the era of AI and automation to Comparison solutions, showing how they need to evolve to meet the changing demands of end users and the market. The Solution Spotlights aren’t recorded, so make sure you don’t miss it! Nick Thomson, our CRO, is also live and in effect on Wednesday 16th. In Palm H, from 4.30pm to 5.00pm, Nick presents ‘Legal DLP and Document Security’, which has headed to the top of every security officer and risk managers to do list. And, as if that wasn’t enough, we’re also really looking forward to Wednesday evening. That’s when we’re co-hosting drinks with our amazing partners, iManage. 8pm to midnight in the beautiful Daylight Beach Club, have your Hawaiian shirts and flip flops at the ready. It’s going to be a lot of fun, with cocktails and food for all – just don’t forget to register for this one. Before you head home, why not arrange a personal one-on-one with one of the Workshare team on Thursday? You can book a meeting in Palm H at a time that suits you and speak to a member of our expert team. Co-founder of Workshare and co-inventor of DeltaView, Barrie is coming to ILTACON to have strategic conversations with you about the future of the legal desktop, increasing mobility and the power of innovation. Since you’re interested in security and risk, we want to get you in front of Nick Thomson, our resident security thought-leader. Nick is currently leading development of our Risk Analytics and Data Loss Prevention feature sets. Owen co-invented the basis of Workshare Transact having been a Transactional Lawyer for more than 8 years prior to joining us. He’s a qualified lawyer, experienced in Transaction Management and an expert in the solution taking UK law firms by storm. Ryan is on hand to answer questions about our product roadmap and to discuss our current or near-term product strategy with you. We look forward to greeting you next week!